In recent weeks GARC have publicised findings from a Freedom of Information request that demonstrated the daily reality of PSNI political policing in the Ardoyne and Marrowbone areas. This FoI showed that there have been 4597 Stop and Searches, 262 raids, 144 arrests, 23 charges and yet only TWO arrests from Jan 2009-Jan 2015. In light of these findings, GARC sent letters to five local community organisations, asking to discuss them and to ascertain their current position regarding promoting and endorsing the PSNI. To date only the Ardoyne Fleadh Cheoil have responded, stating that they do not support or endorse the PSNI, nor do they apply or receive any funding from them. Sinn Fein then engaged in attacks on GARC, via MLA and West Belfast resident Gerry Kelly, supported by Father Gary Donegan. He defended the PSNI in a letter delivered to local residents. He defended the rights of community organisations to promote the PSNI amongst our young people. He has previously defended the use of child informers by the PSNI. In supporting Kelly, Fr Donegan stated that GARC (people that live here) had “no right” to an opinion. Kelly’s comments came as no surprise, given that in Derry just a few short weeks ago Declan Kearney, National Chairperson of Sinn Fein, stated that “the PSNI is not involved in political policing”. In recent days elected reps in Downpatrick told local people it was wrong to criticise PSNI officers that allowed anti-socials to run amok as they sat and watched. In South Armagh a local Sinn Fein representative this week cried publicly that the PSNI were being withdrawn from the area. Last month, Martin McGuinness said political policing was a “legacy issue” and a thing of the past at Feile an Phobail. This morning, leading Sinn Fein member Bobby Storey has been arrested by detectives from the PSNI’s Serious Crime Branch and taken to Antrim Detention Centre. No doubt this will be met with cries of “political policing” from the same party that for some time now has been demonising anyone in Republican Communities opposed to the PSNI and their campaign of harassment and intimidation. We will hear cries of “attacks on the peace process” from Sinn Fein, directed at the same armed militia that they want introduced into local youth clubs. 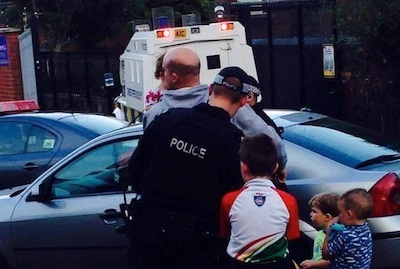 We may even hear mention of the “dark side” to policing, when in areas like Ardoyne there is no bright side. Perhaps now, grassroots members of Sinn Fein who delivered literature to counter a message opposing the PSNI and their political policing (and are forced to defend a party position that in many cases they don’t actually agree with) will realise just how duplicitous their leadership is. Local Republicans and residents’ groups analysis of the PSNI, MI5 and repressive state apparatus and legislation (such as RIPA) is the correct one. Essentially that there is no accountability and that acceptability in communities is unrealistic while any police force exists to perpetuate the inherent injustices of continuing partition and occupation.